Back in 2008, the Archbishop of Canterbury Rowan Williams delivered a cerebral lecture about society and pluralism to a huddle of lawyers gathered in London. It might have remained fairly and literally academic had it not been for his decision to justify his comments in a subsequent BBC radio interview, when he said that Muslims were effectively entitled to have elements of their legal traditions recognised in UK law because Orthodox Jews have their own courts of arbitration, and so do Roman Catholics: “..the law of the land pays respect to custom and community,” he observed. ..a scheme in which individuals retain the liberty to choose the jurisdiction under which they will seek to resolve certain carefully specified matters, so that ‘power-holders are forced to compete for the loyalty of their shared constituents’. This may include aspects of marital law, the regulation of financial transactions and authorised structures of mediation and conflict resolution..
..if what we want socially is a pattern of relations in which a plurality of divers and overlapping affiliations work for a common good, and in which groups of serious and profound conviction are not systematically faced with the stark alternatives of cultural loyalty or state loyalty, it seems unavoidable. …He said yesterday in advance of publication that British law has ‘underlying values and assumptions’ that come from a clearly Christian tradition. ‘Sharia law is not just about punishments,’ he added. ‘It is something of immense sophistication, but it comes from a very different background of jurisprudence to the one from which British law has developed over the past 500 years’. …The problem is reimagining Britain through values applied in action can only work where the narrative of the country is coherent and embracing.’ The Archbishop said: ‘Sharia, which has a powerful and ancient cultural narrative of its own, deeply embedded in a system of faith and understanding of God, and thus especially powerful in forming identity, cannot become part of another narrative. 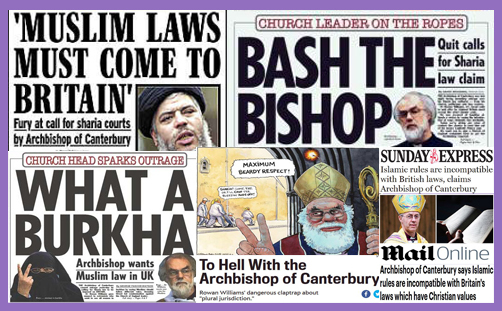 Justin Welby appears to have adopted the very ‘unintelligent’ approach rejected by his predecessor, and opted for the “crude oppositions and mythologies” of the Western view of sharia, making him vulnerable to allegations of ‘Islamophobia’. Others would say his approach is vital for cultural cohesion and the maintenance of national identity, making him vulnerable to allegations of ‘racism’, ‘xenophobia’, or of siding with the BNP or Britain First (or, God forbid, Ukip). This is quite a significant, bold (and risky) stance for the Archbishop to take, and represents a complete U-turn from the position taken by Lord Williams of Oystermouth. Yet the story has been headlined in just two newspapers: the Daily Mail and the Express, and is deemed worthy of a footnote in the Times. Everyone else has ignored it, despite it coinciding with the Government’s more robust approach against the rise of sharia councils (/courts). Rowan Williams was roundly and (almost) universally denounced for saying that Sharia Law in the UK was “inevitable” or “unavoidable”, so why isn’t Justin Welby being commended for saying that it is by no means inevitable and must be avoided at all costs? Why isn’t he applauded for defending the British Christian tradition of jurisprudence? Why isn’t he appreciated for baldly stating that sharia brooks no rivals, and that accepting it even in part “implies accepting its values around the nature of the human person, attitudes to outsiders, the revelation of God, and a basis for life in law, rather than grace, the formative word of Christian culture”? Why isn’t the media giving the man his due? Why aren’t some of those Christians who have long sounded the alarm about cultural relativism and creeping sharia thanking God for the clarity of Justin Welby’s declaration?